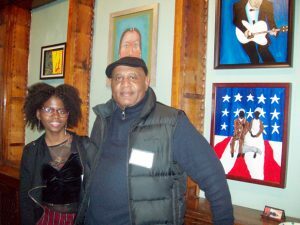 Saturday, at the Howland Cultural Center, 20 local artists took part in the Opening Reception of the 25th Annual African-American Art Exhibit, celebrating Black History Month. The Opening allowed artists to interact with guests about their art as well as enjoy musical entertainment and refreshments. BEACON – Symantha Outlaw will do whatever it takes to complete her art, especially when she is on a roll and in the groove. 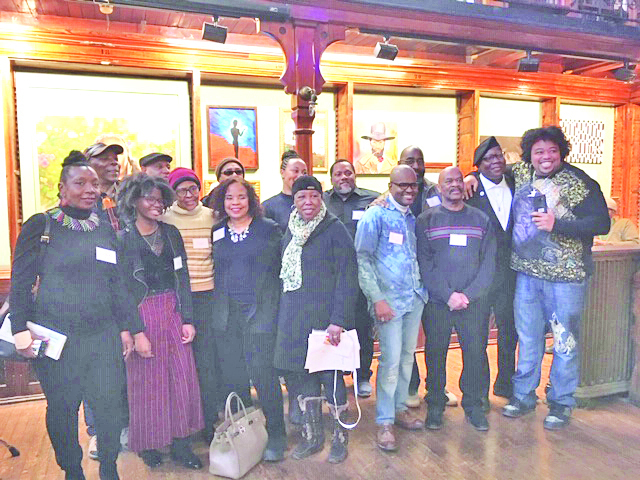 It’s that level of passion that could be found among all 20 artists (including Outlaw) at the current Art Exhibit at the Howland Cultural Center: “The 25th Anniversary African-American Artists in the Hudson Valley,” honoring Black History Month. The young Outlaw is marking her eighth year in the Show, one she has shared showing her creations, along with those of fellow artist, her father, Richard Outlaw, the entire time. Symantha Outlaw and Richard Outlaw. Her father, who is showcasing three works in this month’s Show, is one of the more veteran artists, marking his 15th year at the group venue. In addition to the Outlaw’s paintings, the long-standing, popular Show also features sculptures and photography. Saturday, at the exhibit’s Opening Reception, where a tribute was paid to one of the local, young artists, Kyra Husbands, who received a college scholarship to pursue a major in art and music by the Ray Watkins Band filled the aesthetically beautiful Howland Cultural Center, a large crowd was on hand, admiring the wide variety of art while mingling with one another as well as the artists themselves. One of those talented, local artists was Beacon’s own Oliver Spearman, who is showcasing his art for the third year in the popular February exhibit. Eleanor Thomspon, another Beaconite, and the first African-American to serve on the Beacon City Council, also is among the artists in the Show. Featuring two pieces, Thompson has an ink as well as an ink on canvas on display; one is her grandson’s, a budding young artist whose work fills her with pride, as does the very place that is housing the artwork of 19 other artists for the milestone 25 year anniversary. The African-American Artists in the Hudson Valley show will run through the month of February, honoring Black History Month. The Gallery hours are Friday-Monday, from 1-5pm with the exceptions of Sunday, February 17 and 24.